October 22, 2016--Well, that didn't work. Six months ago I organized my stash of threads by brand rather than by color. A lot of work--3 days in fact. No go for me. Recently I agreed to participate in a pilot stitch program that requires the use of your own threads. So now I wanted to stash dive to see what color I might use and found myself tearing my hair out trying to locate all threads of one color. Aaarrrgggg! Soooo, the only thing to do was to reorganize the threads by color and do it better than before. After a day of threads all over the floor of my craft room, I now have bags of thread sorted by color using the Joen Wolfrom system. For my new project, I was able to find the threads that, to me, would be perfect. And it only took five minutes. Another reason to keep threads by color rather than brand--it's so much easier to put them away after a project is completed. To keep brands together, I had to search for where that brand was located. It wasn't bad for brands with lots of threads, e.g., Splendor, DMC Perle 5, etc., but the lesser used brands with fewer threads in my stash were impossible to immediately get my hands on. And I have a lot of those various brands with just a few threads. 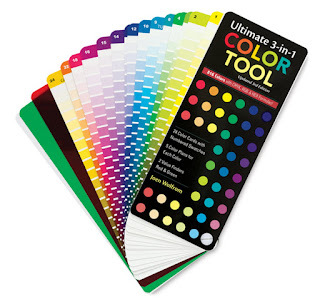 When looking for colors, those lesser brands were overlooked. Not anymore. Yay! And as for knowing what threads I have for what brands--I can still get that information by using my HanDBase Thread Inventory database. All is well now. April 9, 2016--For quite a few years I've lived with my thread stash organized by color. For example, all the red threads were in a clear plastic bag together, all the blues in another, no matter what the brand. I had about 10 or so bags of different colors. Not a bad way to organize threads, but a royal pain when looking for a particular brand name. So, after reading on various blogs how many have organized their threads by brand name, I decided to do the same. However, I did not purchase the beautiful plastic bins and organizers that have been proudly displayed in photos. Instead, I've placed all threads of one brand on a "ring" in color order (not number, at least not yet). So all my RG/Splendor threads are now together on one ring, my DMC Perle 5's are on another, etc. I'm using inexpensive rings instead of plastic organizer boxes because I don't know if I'm going to like this new setup. I'll give it a year. If it works, great. If not, all the threads will go back to my color "filing" system which is certainly easier to use when putting threads away after a project is completed. Whew, what a job. It took 3 days to organize about 1500 different threads. I suspect I'll tweek this system over the next year by placing the large brands in numerical order rather than by color, and place all the miscellaneous little brands by color only because at this time I haven't a clue how I'll find them again, never mind add to them. Miscellaneous Cotton Threads on "Rings"
I really think it depends on how you stitch. I mainly stitch based on designs so mine are ordered by brand (I pretty much only have DMC) and number. If I want to find something by color, I have a DMC color card that I use to pick my colors and then take them out. I find that if you tend to do a lot of color changes, thread painting or just like to design threads should be organized by color. It just makes things easier to choose if you have all the colors or the sam family together.